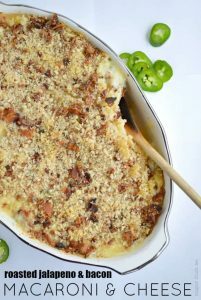 Baked pasta in a spicy from-scratch cheese sauce made with sharp white cheddar and roasted jalapenos, and then topped with bacon crumbles. 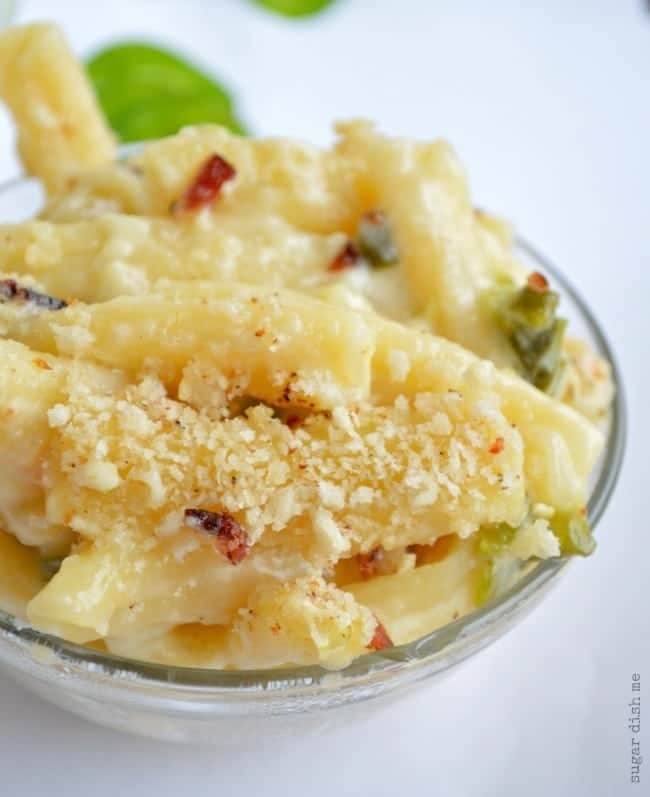 Roasted Jalapeno and Bacon Macaroni is comfort food at its best! It makes a terrific side dish or a stick-to-your-ribs stand alone meal. This post is full of good news. First, let’s agree that macaroni and cheese is always good news. 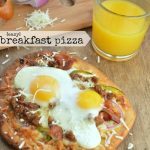 Adding jalapeno peppers and bacon to anything is also really good news. The goodest news? Besides the fact that I will not type “goodest” ever again? Is that one cheese-loving reader can win a copy of the Cabot Creamery Cookbook and a year’s worth of cheese. 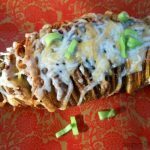 Of course you are welcome to scroll past all my jibber jabber and go straight to the part where you enter to win a copy of the cookbook responsible for things like Roasted Jalapeno and Bacon Macaroni. BUT! We are friends and you like the jibber jabber, right? So let’s start by talking cheese. I am sure that by now you know that I not only love cheese, but I adore all things dairy. Ice cream, cream cheese pie, grilled cheese, PIZZA… this list could get really long really fast. You get it though. Because you would not be here if you did not love cheese, too. From the start of Sugar Dish Me I have worked with and shared all my favorite Cabot dairy products with you. Their yogurt makes the best freaking biscuits ever, and also my favorite dip. 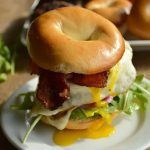 Their light cheddar is responsible for low-cal cheesy broccoli potatoes, and the chipotle cheddar makes an amazinggggg Taco Supreme Grilled Cheese. It makes sense that I flipped over a Cabot Creamery Cookbook, right? I have made no less than 6 recipes in the short time I have had this book in my possession. I WANT TO MAKE THEM ALLLLLL. And I will. 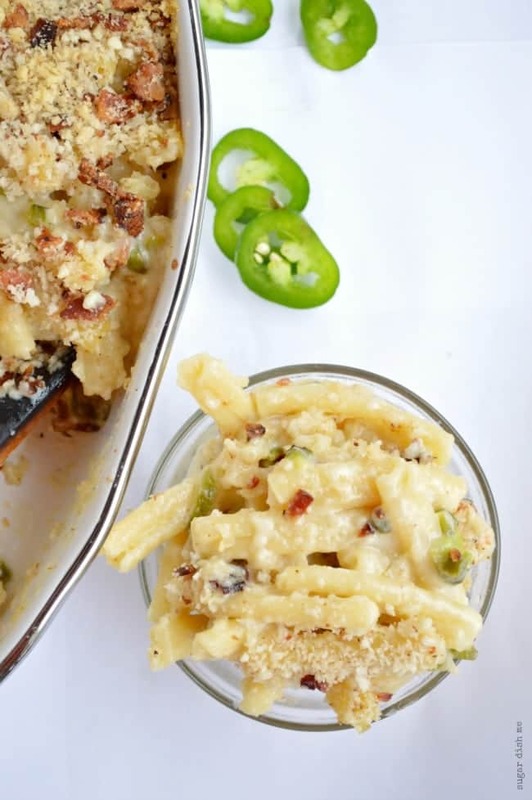 But I felt that it was imperative that I share this Roasted Jalapeno and Bacon Macaroni with you immediately. 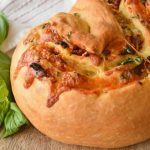 Cheesy, spicy, bacon-ey – it is all the things you want in comfort food. 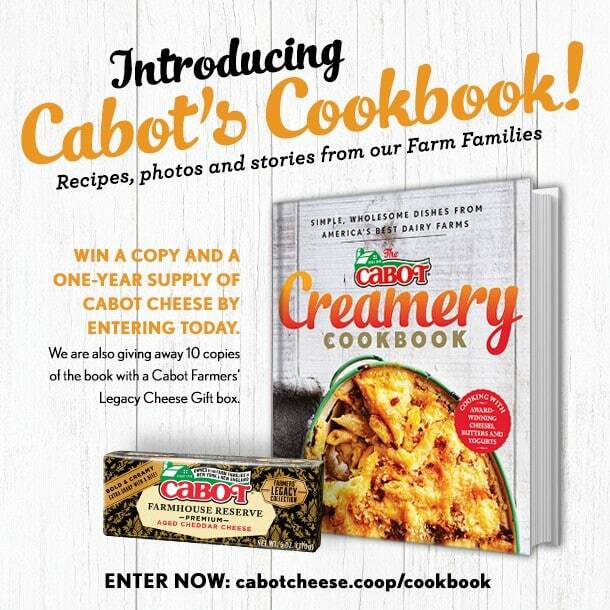 And enter to win a Cabot Cookbook plus some delicious cheese. Place the jalapeno peppers on a baking sheet and broil on high for about 4 minutes per side, or until the skin is blistered.Remove the peppers from the oven when they are blistered all over. Let them cool for 1 -2 minutes before sealing them in a plastic bag for about 10 minutes. This will make the skin peel away easily. Peel the skins, remove the seeds, and then coarsely chop. Set aside. Reduce the oven temp to 350F. While you are roasting the peppers, bring a large salted pot of water to a boil and then cook the bacon in a skillet. Add the pasta to the salted water and let it cook until it's al dente.Remove the bacon to a cutting board. Chop the bacon and in a medium bowl toss it with the Panko breadcrumbs, adding about 2 tablespoons of the bacon grease to moisten the mixture. Butter a 2 quart baking dish and set aside. Drain the pasta, leaving it in a colander in the sink. Place the pasta pot back on the stove and melt the 2 tablespoons of butter in it. Stir in the flour and whisk until smooth. Add the chopped jalapenos. VERY GRADUALLY pour in the milk, whisking well after each addition. Let it come to a slow simmer. Then remove from the heat and stir in the cheese. Add the pasta back to the pot and toss to coat. The sauce will be very saucy. Don't worry! 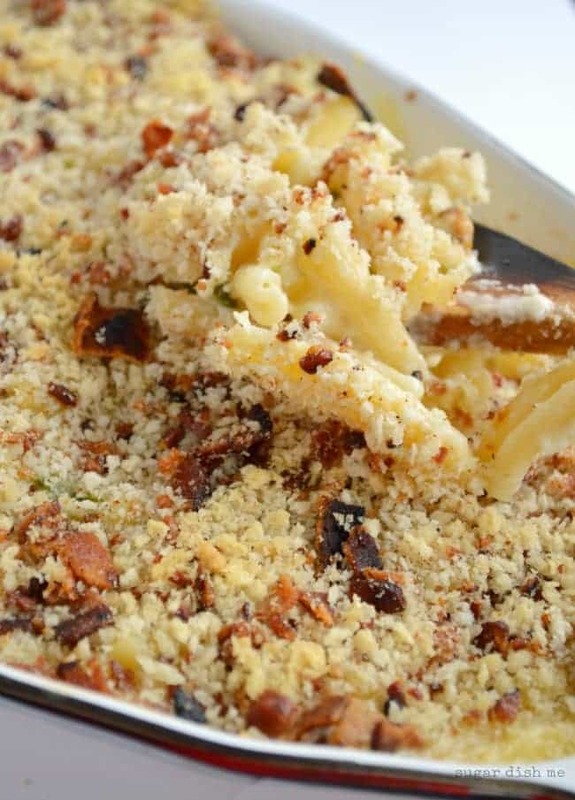 Pour the cheesy pasta into the prepared baking dish and cover with the bacon panko mixture. Bake for 25-30 mins. Cool slightly before serving. Please, just shove this in my face. All up in there. It looks CRAYCRAY GOOD. You had me at CHEESE. I could eat this whole pan in one sitting by myself. Drooling and hungry! I will say it was SO HARD not to do! Thanks Laura!! !